Ever since the advent of collective bargaining not long after the industrial revolution made a generation of workers obsolete - a scenario which is being replayed now with the robotization of the workforce - libertarians have screamed bloody murder, accusing labor unions of artificially skewing the labor market and creating structural imbalances within the workforce. And after a long and bruising battle, the libertarians (and not far behind them, the conservatives) of the world are finally close to declaring victory, even if the outcome may not be precisely what they desired. As Credit Suisse explains in a recent analysis on growing deflationary forces prevalent in the labor market, as industry power becomes more concentrated, and employers move closer to becoming monopsony buyers of labor, the fundamental bargaining power of labor is diminished. The result has been a secular reduction in collective bargaining agreements to the point where they are virtually irrelevant. Furthermore, the fall seen in workers' union membership, and thus in coverage under collective bargaining agreements – a trend seen across all developed economies – has structurally weakened labor's bargaining power to the point where unions are now generally seen by the broader public as parasites on the back of non-unionized workers (the collapse of the Detroit automotive powerhouses is rightfully blamed on labor unions). The above observation suggests that one of the main reasons for the collapse of the Phillips curve, i.e., the lack of near-record employment to result in higher wages, greater wage growth, and thus inflation, is that the slow but sure death of labor unions is to blame. Which is ironic: while on one hand libertarians can declare victory over hated collective bargaining, the flipside is that this only took place as a result of corporations growing increasingly more powerful, not only financially but also politically, thanks largely to their lobbying power which has never been as great as it is now. There's more: if indeed unions are to blame for the lack of emerging wage growth - and they are hardly alone, here one can also add the growing influence of part-timers and the gig economy; geographically flexible markets where advanced technology allows workers to work from home pushing down the NAIRU, the deflationary impacts of technology which creates much more competition and visibility on service pricing with technology enabling easier switching - one can indirectly blame the failure of labor unions for the biggest asset bubble in history. After all, if wage inflation - measured in its traditional, if incorrect, way - had re-emerged by now, almost ten years after the launch of QE, the Fed and central banks would be far more aggressive in tightening financial conditions, i.e. 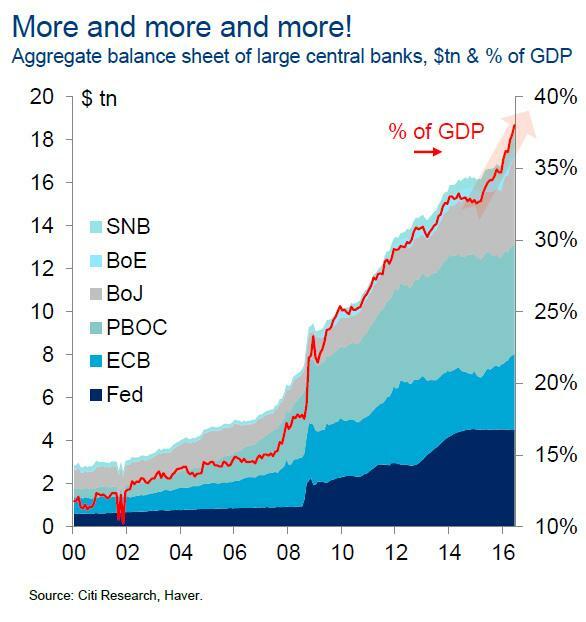 sending risk assets shaprly lower, instead of debating whether to hike 25 bps at a time when there is still some $3 trillion in excess reserves sloshing around the system and resulting in the biggest liquidity bubble of all time, amounting to roughly $20 trillion in global excess liquidity. Whatever the unintended consequence of the slow death of labor unions, it is now set to accelerate even more: late on Friday, president Donald Trump signed executive orders restricting the activities of unions that represent many of the U.S. government’s 2.1 million employees, the White House said. As Bloomberg reports, one of the three orders signed on Friday limits the amount of official time federal employees can spend on union duties to no more than 25%. It also requires the federal government to start charging union members rent for using space in federal buildings, to stop paying employees for the cost of lobbying the federal government, and to more aggressively negotiate union contracts. Trump’s move to curtail the activities of federal unions follows a wave of laws over the past decade restricting public-sector collective bargaining and weakening government unions - as shown in the chart above - moves that conservatives see as helpful in shrinking government and undermining political foes. Meanwhile, America's increasingly endangered labor unions are screaming bloody murder. The nation’s largest federal employee union, the American Federation of Government Employees - which naturally endorsed Hillary Clinton for president in 2016 - blasted that Trump's decision "is more than union busting - it’s democracy busting. These executive orders are a direct assault on the legal rights and protections that Congress has specifically guaranteed to the 2 million public-sector employees across the country who work for the federal government." And with corporations doing everything on their side to crush what little is left of private sector labor into submission, it is now only a matter of time before collective bargaining is a thing of the past. So yes, on one hand, the biggest manipulator of the labor market is on its last breath, but its death will only enable the biggest manipulator of asset prices to become even strong, because the death of unions and continued low wage growth, will be just what the Fed, and those who benefit from perpetually easy monetary conditions, ordered.